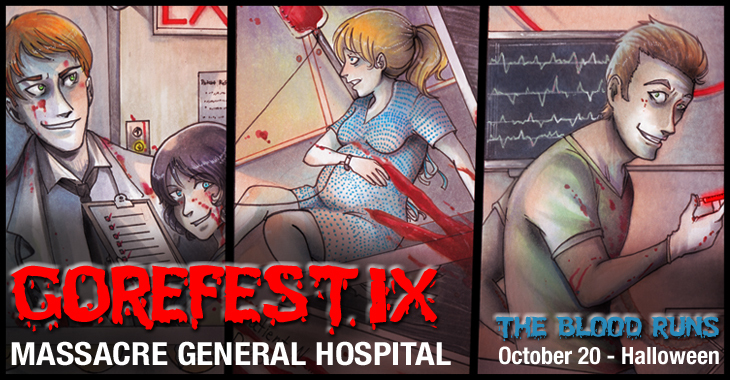 Gorefest 9: MASSacre General Hospital by Laura Clark and Misch Whitaker, music and lyrics by Melissa Carubia, ImprovBoston, 10/20/11-10/31/11. http://www.improvboston.com/gorefest?ref=slide. For Mature Audiences Only. (Cambridge, MA) Once again, ImprovBoston treats audiences to the guts and glory, but especially guts, of a Halloween comedy show. This time, the theater gives its audience a seasonally appropriate splatter musical set in a hospital. A young and more or less well-adjusted couple, Carla and Trevor, get into a car accident and venture into the Braggs Memorial Hospital. Not so secretly, something about the facility is wrong, especially when Carla’s unborn baby starts getting a little too much attention. The zombie-like orderlies, the Jeffs, act as minions to the head nurse, a sadomasochistic woman in pearls who recalls Rocky Horror as much as anything else in the show’s set-up. Once the plot begins to pile on horror tropes like murder, exorcism, masochism, and necrophilia, however, it becomes its own monster. It’s spectacle theater, delightful to those who can stomach its macabre contents. Actors gleefully and casually dig through cadavers for body parts, some of which are squirted onto each other and into the audience. MASSacre General Hospital is stitched together with surreal, strange, and often scatological comedy, a fun show even when the story gets particularly dark. Suffice to say, this year’s Gorefest, written by Misch Whitaker and Laura Clark with excellent music by Melissa Carubia, is not appropriate for children. A night out with college friends or relatives with a dark sense of humor, yes, but some more faint hearted theater goers may be too shocked to laugh when the bodily fluids begin to fly. Of course, this only means a better time for everyone else willing to get a little dirty. Bobbey Smithney directs cast members Melissa Carubia, Nick Garner, Alex LeBaron, Robert Woo, and others who appear to have a great deal of fun with the material. Complete with live band and complimentary plastic tarps, MASSacre General Hospital is a musical guilty pleasure for horror fans. This entry was posted in Comedy, Musicals and Opera and tagged 2011, Blood, Bobby Smithney, body parts, cadavers, Cambridge, Comedy, dancing, Dark Comedy, Gorefest 9, Halloween, Horror, hospital, ImprovBoston, Innuendo, Laura Clark, MA, MASSacre General Hospital, Melissa Carubia, Misch Whitaker, musical, October, singing, splatter, spurts, tarp, zombies by gilliandaniels. Bookmark the permalink.